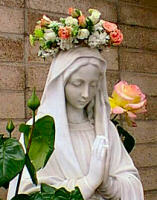 Hail, holy Mother, thou who didst bring forth the King who rules heaven and earth forever and ever. The practice became especially popular among the members of the Jesuit Order  by 1700 it took hold among their students at the Roman College and a bit later it was publicly practiced in the Gesu Church in Rome. From there it spread to the whole Church. The practice was granted a partial indulgence by Pius VII in 1815 and a plenary indulgence by Pius IX in 1859. With the complete revision of indulgences in 1966 and the decreased emphasis on specific indulgences, it no longer carries an indulgence; however it certainly falls within the category of the First General Grant of Indulgences. (A partial indulgence is granted to the faithful who, in the performance of their duties and in bearing the trials of life, raise their mind with humble confidence to God, adding  even if only mentally  some pious invocation. Excerpted from Enchiridion of Indulgences. 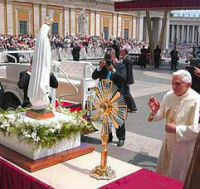 The pious practice of honoring Mary during the month of May has been especially recommended by the Popes. Pius XII made frequent reference to it and in his great Encyclical on the Sacred Liturgy (Mediator Dei) characterized it as one of "other exercises of piety which although not strictly belonging to the Sacred Liturgy, are nevertheless of special import and dignity, and may be considered in a certain way to be an addition to the liturgical cult: they have been approved and praised over and over again by the Apostolic See and by the Bishops" (no. 182). Paul VI wrote a short encyclical in 1965 using the Month of Mary devotion as a means of obtaining prayers for peace. He urged the faithful to make use of this practice which is "gladdening and consoling" and by which the Blessed Virgin Mary is honored and the Christian people are enriched with spiritual gifts" (no. 2). 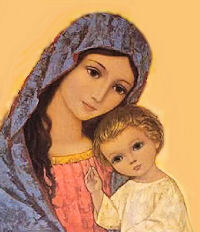 In May of 2002 Pope John Paul II said, "Today we begin the month dedicated to Our Lady a favourite of popular devotion. In accord with a long-standing tradition of devotion, parishes and families continue to make the month of May a 'Marian' month, celebrating it with many devout liturgical, catechetical and pastoral initiatives!" The Holy Spirit, as Pope Leo XIII reminded us, is the soul of the Church: All the activity and service of the members of the Church, beginning with the supreme participation of the Blessed Mother in the work of the Church, is vivified by the Holy Spirit as the body, in all its activities, is vivified by its soul. The Holy Spirit is the Paraclete, Advocate, and Comforter which Christ Himself sent to be our consolation in the sorrowful mysteries of life, our source of moderation in the joyful mysteries of life, our added principle of exaltation in the glorious mysteries of life. So He was for the Blessed Mother; so also He is for the least of us; so also He is for the rest of the Church, even for those who are its unconscious but conscientious members. If, then, piety is the virtue which binds us to the sources of all life, to God, to our parents, to the Church, to Christ, certainly Christian piety binds us, in grateful love, to Mary  or our acceptance of Christ and of the mystery of our kinship with Him is imperfect, partial, and unfulfilled. In our observance of the Marian month we should take into account the season of the Liturgical Year which largely corresponds with the fifty days of Easter. Our pious exercises could emphasize Our Lady's participation in the Paschal mystery and in Pentecost with which the Church begins. The pious exercises connected with the month of May can easily highlight the earthly role played by the glorified Queen of Heaven, here and now, in the celebration of the Sacraments of Baptism, Confirmation and Holy Eucharist. The following practices which are recommended by the Magisterium are offered as suggestions for honoring Our Lady during Her month. Also called the Psalter of the Blessed Virgin Mary, the Rosary is one of the most excellent prayers to the Mother of God. Thus, "the Roman Pontiffs have repeatedly exhorted the faithful to the frequent recitation of this biblically inspired prayer which is centered on contemplation of the salvific events of Christ's life, and their close association with the Virgin Mother." These consist of a long series of invocations to Our Lady, which follow in a uniform rhythm, thereby creating a stream of prayer characterized by insistent praise and supplication. The Roman Pontiffs have frequently expressed appreciation for the pious practice of "consecration to the Blessed Virgin Mary" and the formulas publicly used by them are well known. Louis Grignon de Montfort is one of the great masters of the spirituality underlying the act of "consecration to Mary". He "proposed to the faithful consecration to Jesus through Mary, as an effective way of living out their baptismal commitment." These are witnesses of faith and a sign of veneration of the Holy Mother of God, as well as of trust in her maternal protection. The Church blesses such objects of Marian devotion in the belief that "they help to remind the faithful of the love of God, and to increase trust in the Blessed Virgin Mary." In the Byzantine tradition, one of the oldest and most revered expressions of Marian devotion is the hymn of the "Akathistos"  meaning the hymn sung while standing. It is a literary and theological masterpiece, encapsulating in the form of a prayer, the universally held Marian belief of the primitive Church. 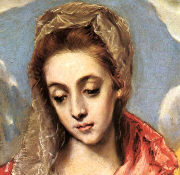 The Litany of the Blessed Virgin–also called the Litany of Loreto–is one of the many Marian litanies, or praises of Mary, composed during the Middle Ages. The place of honor it now holds, in the life of the Church, is due its faithful use at the shrine of the Holy House at Loreto, which, according to tradition, was the small cottage-like home where the Holy Family had lived and which was miraculously transported by angels, in 1291, from the Holy Land to its present location in Loreto. It was definitely recommended by Pope Clement VII and approved by Sixtus V in 1587, and all other Marian litanies were suppressed, at least for public use. 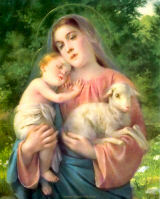 Its forty-nine titles (fifty, or fifty-one, or even more, in some versions: with "Mother of the Church" and "Mother of Mercy" and being the 'official' 'newcomers' in recent times and which are included on the Vatican website version) and invocations set before us Mary's exalted privileges, her holiness of life, her amiability and power, her motherly spirit and queenly majesty. Reflection on the titles of the litany, therefore, will unfold before us a magnificent picture of our heavenly Mother, even though we know little about her life. Sixtus V, who had entertained a singular devotion for Loreto, by the Bull "Reddituri" of 11 July, 1587, gave formal approval to it, as to the litany of the Holy Name of Jesus, and recommended preachers everywhere to propagate its use among the faithful.